Can the reverse thrust action be added to the checklist?? I mean the co-pilot to do it?? as in several times even the F2 is not responding at time....or even an engine will reverse while the other is not/not with same value. Thanks for your reply.....well could it be added as an option like Auto-radar?? ??? That's strange as the original Airbus procedures require reverse to be selected immediately after mainwheel touchdown at every landing, especially due to the Airbus specific spoiler and autobrake logic. Well I know that engaging the reverse. Thrust is a pilot decision....but as a frank talk.....I never been landed anywhere "as a passenger" without reverse thrusts ever. Hi, I talked to the other developers: There have been previously a lot of discussions going on regarding this subject......Do you have any official Airbus document where it clearly states that this a mandatory procedure ...... or it is just your "knowledge"? Here you are... You should be aware of this procedures by yourselves, this kind of things should not be asked to the customers. Fcom states that Max Reverse should be used, unless noise abatement procedures prohibites it. By the way it is Pilot Flying responsibility to engage reverse thrust, so, inserting it as a checklist/copilot duty, is unrealistic. If you intend to implement the requested modification, please let to the users the option to deactivate it. You should be aware of this procedures by yourselves, this kind of things should not be asked to the customers. And you should be aware that not all the time can he contact someone internally that would have this information....and also should be thankful that he cares enough to ask customers for features and specific information on the features they want. The information is publicly available on the internet with a bit of search involved, and what was asked is a standard Airbus OP. By the way I do not want to start a flame or whatsoever, I just expressed my customer point of view. Of course I am glad that you ask what features we want, but sometimes I really don't understand the answers you give, and the way you ask for information. Looks like you all feel personally attacked everytime someone point out something that differs from the real plane. I really much appreciate this addon so far, and I know you are getting it better, and I know that this is a mid-core product, so keep up the good work. No flame war, nothing is personal. Tone is everything, and lack of tone in text does not bode well. Just pointing out that this is a learning process on both sides, and we've learned, very well, that if a user or tester requests something, proof needs to be given on said feature. If we don't do that, then we get 3 threads/e-mails a day saying 'This is COMPLETELY wrong! How could you do this? Did you even test this thing?' etc. Everyone wants as much accuracy as possible, and if we get something wrong, you'll know that we change it. The end point being there needs to be proof for that change to occur. That's all. ......Do you have any official Airbus document where it clearly states that this a mandatory procedure ...... or it is just your "knowledge"? I'm a bit surprised about this question because I assumed the development team did use official Airbus documents for the AXE development ?!?!? REVERSE THRUST at an early stage of the AXE development was part of the checklist functionality. But because there are certain situations - like “geckuz” wrote where "noise abatement procedures prohibites" the use - we took it out. Maybe my expression was wrong to call the standard "not a common procedure" .....I was pointing to the exemptions. I am sorry for that - . 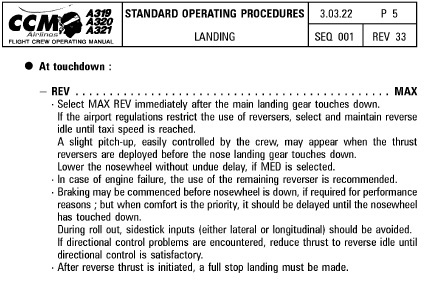 In the written checklists (please see Vol6 StepbyStep guide) #273 and #276 the subject “REVERSE THRUST” is still included. With asking “---“ to prove his statement I wanted to provoke him to make his statement more clear i. e. that there are exemptions..... Sorry if I have been misunderstood. There is of course the possibility to include REVERSE THRUST into the checklist but together with an option in the right MCDU to set it to OFF for certain flights but this is what I meant talking about other priorities…. Will be very good if this will be implemented. If this will be included, will be in SP1? Bad idea to ''provoke' a customer and little chance to succeed nevertheless, there are no exemptions regarding reverse selection after maingear touchdown IRL. It's needed for the autobrake and spoiler logic/back up. Max reverse is a different story, but idle reverse is a must IRL. I am not sure I am understanding this right. Do you want to include reverse trust in the checklist or not? I think this unnecessary and not real. Did you ever hear in a real cockpit or cockpit video the PNF saying "set reverse trust" or even worse grab the reversers by her(him)self. I think this is already very nicely modeled in the current AXE checklist; PF sets the reversers and the PNF confirms the engagement.